Find hotel near Virgin Islands National P ..
Virgin Island National Park is one of the famous islands in United States that is formed by covering nearly 60% of Saint John Island. It consists of 5500-acre of the neighbourhood ocean. The park was established in 1956 and is ranked 29th among the national parks of United States. The major activities that take place in this park scuba diving, snorkelling and hiking. The hiking trails are beautiful covering the tropical rainforest. There is an outdoor picnic area attached to the place along with restrooms and maps It provides one of the best view that any national park can offer in US. 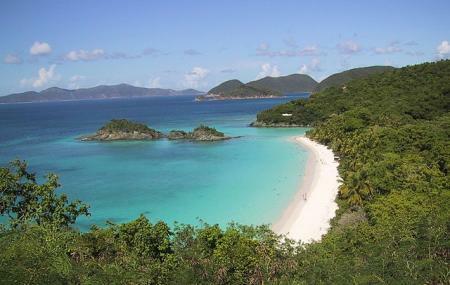 Use Charlotte Amalie trip planner to visit Virgin Islands National Park and many others to your visit. Fine Accommodation options like Sugar Bay Resort And Spa, Harbour Beach Villas and Frenchman's Reef & Morning Star Marriott Beach Resort will meet your requirement of where to stay in Charlotte Amalie. Generate executable plans on your own or book the top rated Charlotte Amalie vacation packages for your visit. Read more on how to reach Charlotte Amalie. Love this? Explore the entire list of places to visit in Charlotte Amalie before you plan your trip. Fancy a good night's sleep after a tiring day? Check out where to stay in Charlotte Amalie and book an accommodation of your choice. I can not get over how beautiful this place is! I wish I could have visited for more than 2 days, wow. Everything is natural, perfect, except for the occasional beach litter (maybe mostly due to it being the busy season). Could use just a couple more trash receptacles. Absolutely beautiful, stunning, incredible. Lovely and amazing all at the same time. The tour guides were all simply amazing and absolutely did great with questions and showings us around their homes. Destination you should definitely out on your bucket list! This is my happy place. We often hike out to many of the amazing beaches to snorkel. Some can be a 2 mile hike into the jungle but are worth it everytime..
Can you give a place 6 stars? I have found my new favorite place to be. It offers peace and quiet, adventure, rigorous hikes, amazing snorkeling, and limited commercialism. Hurricane damage still exists above and below water (Feb 2019), but this place is still like no other! Absolutely Amazing! I recommend the Caneel Trail, it's a fairly steep hike that's well worth it! Your first view point is 24 minutes in and you can see both North shore and Cruz bay. The next view point is 42 minutes, from the start, and it just Rocks!